When deciding their next foreign hunting destination, most bowhunters will think of places like US, Canada or South Africa. However, there are a wide variety of other destinations to be discovered. That is the case of Spain, a country which offers a wide range or opportunities and a great variety of species. 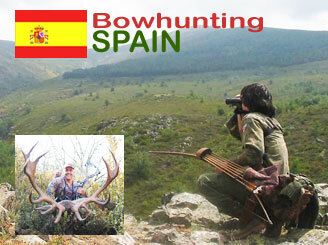 Many gun hunters have already found Spain, but it is not yet a “must hunt” country for most bowhunters. Spain is a country of diverse geography. With high mountains, vast valleys, lush forests and both humid and dry places. Such variety generates diverse game, both for big and small game bowhunting. Hunting has always been present in the Iberian Peninsula, generating a large amount of revenue and having a great impact on rural life. Such tradition has lead to a population of around 1 million of hunters, and that demand has pushed quality hunting in Spain to become more expensive. But high prices are offset by the excellent quality of the hunts including game quality, accommodations, lunches, shuttle services etc. Bowhunting is a recent phenomenon in Spain, but the number of bowhunters has increased dramatically in the last few years. At present, in order to be able to hunt in Spain, nothing is required with the exception of a few areas. It’s still best to ask your hunting outfitter before coming. The Iberian Peninsula has a variety of fauna both major and minor. Without any doubt, the Hispanic ibex is king. It is a unique animal in the world and debatably possessing the most incomparable beauty. It lives in mountain areas and the best way to hunt it is spot and stalk, generally during the warm season when males are more active. It is quite a spectacle to see ibex fight. They are relatively possible to hunt with the bow as they get confident with the heat. If you are a skilled bowhunter you can have shooting opportunities. We have two subspecies of chamoix, one from the Pirinees and another one from the Cantabricus, a beautiful animal but very difficult to get with the bow. The Hunts are tough and conducted in high mountains across open fields - which complicate the stalk. Despite the difficulty, it’s a goal worthy of pursuit. Going deep into the woods we can find animals such as the wild boar, the red deer or the roe deer. 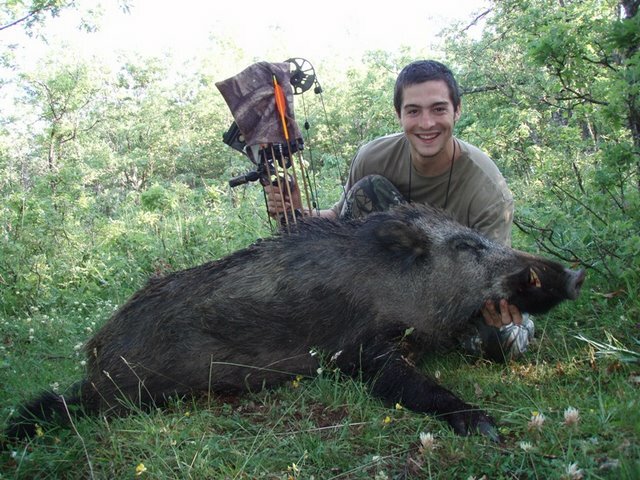 The boar is the animal which keeps most bow-hunters awake during long night hours, being without a doubt the animal preferred and the most bowhunted. In general the technique used to kill this beast is to ambush them by waiting in a treestand or on the ground over feeders. Many times this hunt goes long into the night. Boar bowhunting in Spain requires a short distance shot and the bowhunter should get used to shooting at night. Spanish boars are incredibly tough and do not stop running until they are out of steam, so proper arrow placement is crucial. Big male wild boars can reach a weigh of 100 kg, with fangs of around 25 cm long. The red dear, together with the wild boar, are the most common animals most hunted. Male red deer tend to weigh around 200 kg, our largest animal. They are normally hunted by stalking or waiting, but in some cases are also driven or “Monteria.” The driven big game is a classic Spanish method of hunting in which an area of the scrubland is beaten and pushed with dogs, so as to pressure prey towards the “apostaderos”. Such group of dogs are called “rehalas” and each dog has a different tasks, such as recovery, seizure and chasing. It is becoming more common to see bowhunters located in special posts at “monterias”. Posts which due to their location and of the type of ground cover slow down the animal so they do not pass running, enabling the bow hunter to make a more effective shot. The roedeer is my personal favorite. Called the elf, the roedeer is suspicious, intelligent, fast and has very good senses. They are a real challenge for a bowhunter. It is a small deer or around 25 kg weigh with small antlers full of nuances and character. The fallow deer is another deer that lives in our forests. Weighs more than 100 kg and has antlers of amazing dimensions. Apart from those species mentioned above, we also have spread around the Iberian peninsula species such as the “sheep” and the “atlas sheep” among others. For predators, wolfs can be hunted in certain areas and fox are pretty common. Among the protected species we can find the bear and the lynx, which are preserved and protected. As I have mentioned before, minor hunting (small game) is very relevant and popular in Spain, bringing each year a high number of hunters, especially for chasing the queen - the red partridge. We also have migratory species that fly across the peninsula coming from the north of Europe such as ducks, pigeons, turtledoves, quails, “woodchuck”, gooses etc. There are a wide variety of hunting techniques but the most attractive of all is hunting with a pointing dog. I would highlight the quails for bowhunting due to their ability to hold the “muestra” and to their flight, which make them the perfect prey to be knocked down while in flight. In order to knock them down we normally use special tips made of wire. There are three main types of hunting areas or surfaces: the national reserves are tough to hunt due the few licenses granted compared to the high demand. Privately owned reserves, in which game is leased to the municipalities by the hunters, and the private game farms or ranches (most of them fenced) in which the land is privately owned. Jabali con arco a la espera from Cazandoconarco on Vimeo. With few exceptions, the hunting season in Spain is open the whole year. Between March and April “ibex”, “chamoix”, sheep” and “arruis” can be hunted, as they do not throw their antlers. The roedeer, whose antlers are formed during the winter, starts in April and that period lasts until October. 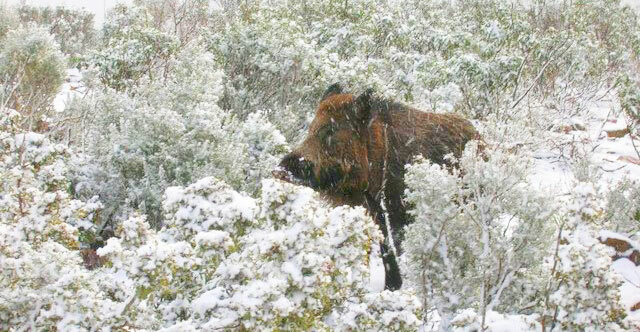 In spring, it is possible to hunt boars “spot and stalk”. The general season starts in autumn and it continues from October to February. During the general season all species can be hunted except for the “roedeer. Spain is a country with an impressive amount of sporting possibilities. 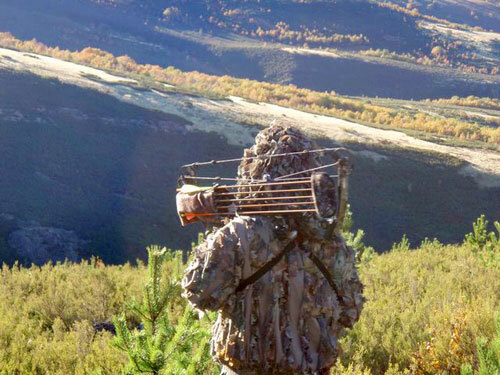 Spain is already popular for firearm hunters but bowhunting is growing steadily. There a several professional organizations which organize hunts for different species with good success rates. Spain is also an amazing tourist destination, receiving more than 55 million tourists who come to enjoy our monuments, the delicious food, and our great beaches. Considering both, the diversity of species and the tourist possibilities that Spain has to offer, bowhunters should consider travelling from the other side of the Atlantic to visit us for a unique and outstanding international bowhunt. "Pedro Ampuero Castellanos (21). A passionate bowhunter who above all enjoys being outdoors either hunting, scouting or just walking around with his dogs. Loves hunting in his home land, but never leaves the opportunity to cross new frontiers searching for hunting adventures. 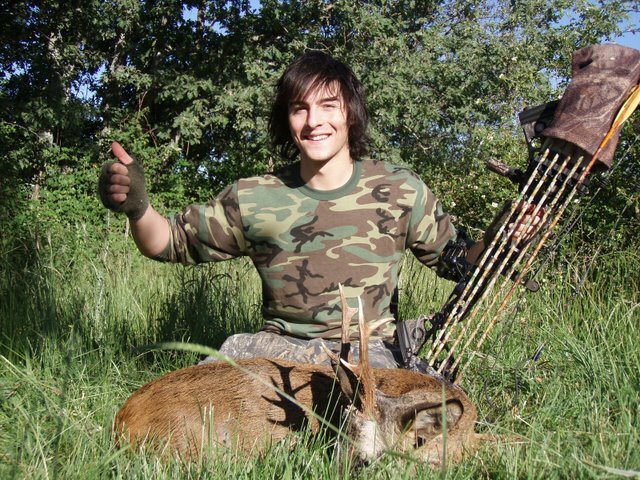 In his free time, this engineering student, tries really hard to promote bowhunting in Spain. Founder of the largest bowhunting web page in his home country www.cazandoconarco.es, organizes once a year the Spanish national meeting of bowhunters. Through his videos and articles tries to spread the practice of this sport that is becoming more and more popular each year. Do not hesitate to contact him (pedro.ampuero@cazandoconarco.es) in case you are interested in knowing more about bowhunting in Spain. "